Can your dig team drive them off? Standing nearly three meters tall, the brutal, barbaric Chest Head is a carnivorous tribal humanoid. Gathering in small warbands, these mutants appear in both extra mutated and standard forms, with their bright reddish flesh, hideous, lumpy bodies and two heads. When they arrive near a hapless human community, the resident’s panic and turn to whatever visiting excavator’s they can find, coaxing them to go forth and deal with the dreaded, man-eating Chest Heads. 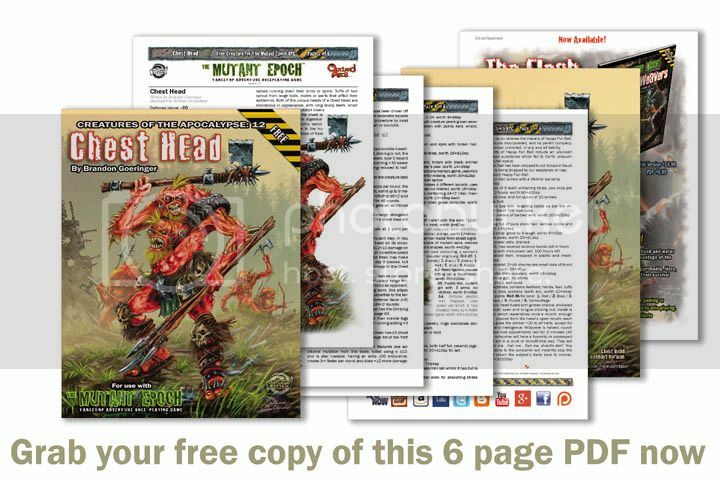 Although crafted for The Mutant Epoch role-playing game, using the Outland System Game Mechanic, a GM can easily modify the stats for the Chest Head and use these nasty humanoids with another post-apocalyptic game system.